81 years ago, this September, a sad, depressed, possibly drunk, unemployed actress left her home on Beachwood Drive and started walking up the road to the Hollywood sign. On that treacherous hike, that probably took her most of the night, she eventually made it to her destination, the fifty-foot letter “H” at the beginning of the internationally recognized Hollywood sign (then the Hollywoodland Sign). She climbed a ladder that was attached to the backside of the flat metal structure, and leaped to her death once she reached the top. It is thought that she did not die instantly, but instead lingered for hours in the brush below, where her corpse was eventually discovered by hikers. For a short time she was simply known as “The Hollywood Sign Girl,” until her published suicide note was recognized by her uncle. Her name was Peg Entwistle. When people tell her tale, they always point out the ironic twist that occurred shortly after her death. A letter arrived at her address, stating that she had landed the lead role in a new play about a woman who commits suicide. However, there’s the bigger (more obvious) irony. This act of desperation over the lack of a show-biz career, ended up making her more famous (or infamous) than any of her working contemporaries. 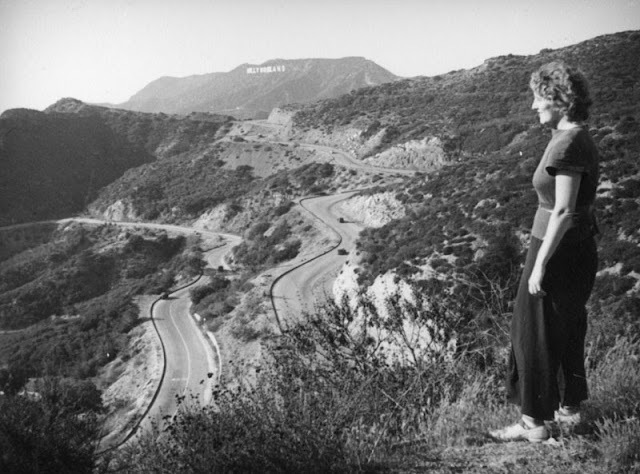 Not everyone can easily name the stars of the early 1930’s, but most people know the Hollywood Sign Girl. Her legend seems to grow with each passing year, and as it does, so do the stories of her restless ghost near the famous landmark. Most people describe her apparition as a young woman dressed in a 1930’s style white gown walking along a trail (sometimes dazed). She is most commonly seen by hikers (not unlike those that originally found her body) and dog walkers in the very early or very late hours. Witnesses claim that she is accompanied by the strong scent of the gardenia flower (thought to be her favorite perfume). Some accounts even describe her reenacting her final moments stepping off of the top of the “H” only to vanish as she falls. She seems doomed to repeat the last moments of that last night over and over again, just as we also seemed doomed to repeat those last moments with each retelling of her story. DIRECTIONS: Follow N. Beachwood Drive up the hill to the end (just before the “Sunset Ranch Hollywood” stables). You’ll see cars parked around a trail head, so park anywhere you can. Follow (on foot) the dirt trail up and along the ridge adjacent to the stables. This trail will merge into a larger trail (Mulholland Hwy). Make a hairpin turn left (South-West) on this new trail, and follow it (going towards the Hollywood sign) until it dead ends at a paved road (Mt. Lee Drive). Turn right on the paved road, seemingly away from the Hollywood sign. The road will take you up the backside of Mt. Lee, offering great views of the San Fernando Valley and Forest Lawn, to the top of the mountain and a dramatic reveal of the Hollywood sign, the same view Peg Entwistle had before she jumped (incidentally Peg’s studio, RKO, is dead center in this view). Below is a link to a map, which you should study, before going out there, since its very easy to get turned around out there on the trails.